apexart :: José Ignacio Roca :: define "context"
Presents the work of six Colombian artists (Juan Fernando Herron, Antonio Caro, José Alejandro Restrepo, Miguel Angel Rojas, Jesus Abad Colorado, and Delcy Morelos) whose work reflects on the problems associated with the reception of a work of art in the absence of a "proper" context. The fact that the artists come from Colombia will not only not be stressed, but altogether ignored, leaving the works to provide the "context" by a close interaction between them. Harald Szeemann once said, "as an old anarchist, I could even say that you only have the right to operate in the name of your native country to show in a better way the width and scope of the art being produced there. If not, I am completely against, and national exhibitions should be abandoned to novel curators and cultural attachés." Being none of theÂ aforementioned (or both), I am bringing together five artists and a photo-journalist exploring a wide variety of media (in-site drawing, video-installation, photography, painting), whose work reflects on the problems associated with the reception of a work of art in the absence of a 'proper' context. It has been common practice to regard artistic production from the fringes of the art centers as 'impossible to grasp' unless an 'adequate context' is provided, be it political, sociological or religious. This, of course, is either a fallacy (that can be used as a means of exclusion), or it also applies to a large part of the current artistic production regardless of where it comes from. Joseph Beuys' work can be seen by anyone without an explicit knowledge of his personal history, but it can be argued that his use of materials and their symbolic references can be somewhat lost without this minimum context. But in the case of art from the margins, it is assumed that the work inserts itself in the space of a common, largely homogeneous postcolonial history that is either taken for granted or presumed to be absent, thus leaving the work unable to be properly experienced or understood. Recently, one New York critic declared that "If you've never been to a banana republic (except, perhaps, to buy a sweater), much of the historical import of Brazilian sculptor Cildo Meireles' current retrospective at the New Museum may be completely lost on you." As a matter of fact, a minimum, general context tends to be shared (but not that of a common 'Latin American'or 'African', for that matterspecificity): within the parameters of western culture (and most artists, except for those whose work is considered 'primitive', work inside this tradition), current globalisation has made information available to all, and cultural referents are shared more horizontally by everyone regardless of the geographical or even political context. Under the cultural construct 'History of Art', some things tend to be homogeneous, and local specificity tends to connect to global concerns. How, then, to define this 'proper context'? The works that conform this exhibition revolve around the notion of context: questioning biased views of a territory that is not well known (Restrepo); reinstating suppressed histories, and showing that they can still be pertinent when removed from their conditions of production (Caro); making connections between similar concerns in totally different contexts (Herrán); showing how a work is interpreted as a direct response to an extreme situation (Morelos); giving view to a local tragedy that is in fact the result of a global problem that refuses to be acknowledged (Rojas, Abad). Context should be defined within an artist personal history, as opposed to his or her cultural (as in Country) appertainment; I would go even further: within the work's particular history. Antonio Caro has written on one of the walls of the exhibition space the signature of Manuel Quintín Lame, a self-taught Indian leader from the twenties that learned law in order to be able to defend his people against neglect and abuse by the Colombian Government. He was tried several times and spent more than 18 years altogether in jail without a single charge being proved against him. In the eighties, a Guerrilla group that aimed to defend the interests of the Indian community named itself after Quintín Lame, so the original history has been replaced by a recent fact, leaving Lame's name related with current political violence. Nonetheless, Lame is still an obscure figure even for informed circles in Colombia; context has to be provided even here. Considered part of the beginnings of Conceptualism in Latin America, Antonio Caro has developed a subtle and precarious work right from the margins of the periphery (he is marginal even in Colombia), working often with indigenous communities and with everyday people. Caro first developed an interest in Lame in the early seventies, in the wake of similar attitudes towards minorities prevalent in those days. Learning by heart Lame's signature, Caro reinstated a presence that all official histories had systematically obliterated (and they still do). Lame's signature in itself is highly symbolic: a syncretism of nineteenth-century calligraphy and Indian pictograms, it has a formal quality that goes beyond an individual, coming to bear presence of two communities in uneasy coexistence. Caro's best-known work, Colombia (1976), portrays the name of his native country written in Coca-Cola typeface, a gesture akin to some pop strategiesto which he is sometimes likened, but with a totally different political agenda. While addressing the patronising relationship between America and his country, Caro's move has proven premonitory (coca-Colombia) of the drug-related events that have marked bi-national relations for the last decade. But this work, which is in the collection of the Museum of Modern Art in Bogotá, will not be shown. Instead, there is a reconstruction of the way this work was included in the Face á l'Histoire exhibition at the Pompidou Centre in Paris in 1997: a Mexican art magazine whose cover portrayed this work, shown inside a showcase. Incredible as it sounds, the curators had no problem in 'creating' a work from a document, without even contacting the artist. Caro thus entered one of the temples of cultural validation without knowing it, and with a work he never made or even saw, but which paradoxically represents him well, because the irresponsible curatorial action shows precisely the point Caro was trying to address:Â the colonial attitudes that still exist in north-south relationships. Latin America was largely seen during the eighteenth and nineteenth centuries alternatively as a paradise lost, with the myth of the noble savage (this clichéd perception is still valid for the alleged Latin American exuberanceboth sexual and natural), or as an underdeveloped continent with no hope whatsoever owing to geographical determinism: the exuberance of natural environment resulted in the lack of possibility for a civilization to develop. As Charles Saffray put it clearly in 1869, "In this favoured country, land is, I dare to say, too generous, because its fecundity delays progress. A rich soil and a mild climate do not demand from man but a few days of work for a year's subsistence." José Alejandro Restrepo's video installations combine images, text and historical research to provide a powerful critique to the way the realities of Latin America have been (and still are) portrayed from abroad. These prejudices are screens that mask a proper understanding of the realities here, as Restrepo's video installation, Humboldt's crocodile is not Hegel's, clearly shows. The work takes as its starting point an epistolary confrontation between Hegel, who never set a foot on the American continent but felt nonetheless authorised to project his prejudices on it (using fauna to signify European superiority over the New World) and Humboldt, whose answer comes from an empirical, not projected, look. 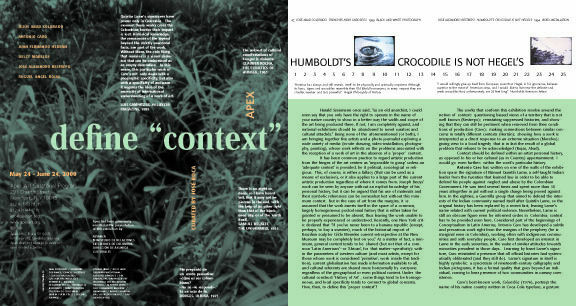 The American crocodile was a much soughtafter piece in the Cabinets de curiosités, predecessors of the Classical museum, and thus an emblematic image of 'the exotic'; confrontation between literary imageswhich is in the end a conflict between the old order an a new realitycontrasts with the videoâ€™s impassive and intemporal image, resulting in a critical field of great power which metonymically replaces with a visual conundrum the actual measure of the problem. On the back wall, Miguel Ángel Rojas has done a drawing, which seen from a distance recalls an illustration from a book on the Wild West; on close inspection, it becomes evident that it is constructed with green 'dots' which are actually made with a hole puncher out of coca leaves. I don't want to get into the difficulties that bringing the materials to make this work in New York meant, but its political implications are all-too obvious. Rojas' installation shows the recurrent vice of history to perpetuate its methods: the conquest of a territory by violent action finds another scenery and other actors, but the roles remain the same. By alluding to the conquest of territories 'to the west' by blood and fireturned into a mythical saga by HollywoodRojas inscribes his work in the current political scene. The official acknowledgement of the guerrilla/drug equation leaves the door open so that military intervention (which is conveniently and euphemistically named "aid") can begin to be put into place. Current 'narcotization' of U.S.-Colombian relationships shows that the problem is actually not political: in the end, it is a question of the markets, of whose money goes where. This narcotization of the relationships between Colombia and the U.S. has found a suitable metaphor in the image of the poppy flower, which has replaced Coca in the last decade as the main illicit crop. "...until the eighties, according to DEA, there was no Colombian heroin whatsoever in the U.S. But in 1993 it took 15% of the market and lately thisÂ figure has risen up to 60%. This reality, which is affecting 600,000 Americans, has led that country to supply to the Police a fleet of Black Hawk helicopters, the same that has begun to defy the heights in search of the 'wicked flower'." El Tiempo, Feb. 7, 2000. Juan Fernando Herrán's ongoing series Papaver Somniferum takes the Poppy, whose presence usually conjures images of beauty, romance or solidarity (in Great Britain, poppy blossoms are sold by the Haig Fund to aid war veterans), as a visual surrogate for the current political situation. There is a visual code used by local police and army of portraying people under arrest with the 'evidence' neatly arranged on a table before them. Herrán appropriates these and other images from the press (in this case a photo of a soldier candidly holding a bouquet of poppies he has just uprooted as a symbol of the effectiveness of police activity in the eradication of illicit crops). In one recent interview, the chief of the drug enforcement service boasted that he had eradicated twice as many hectares of illicit crops as the previous government, while a DEA official remarked at the same time that the growth of those crops had surpassed historical records by far. Who is right? Ironically, both, because criminalisation of drugs (as in Prohibition) only makes business more lucrative. Herrán combines photographs from the newspapers with a German cloth he purchased in Istanbul (where the cultivation of poppies is controlled by the Turkish government), a fake velvet with fuzzy horizontal color fieldsthat recall psychedelic motifsembossed with a poppy flower motif that can only be perceived when seen from the side, as in Holbein's proverbial anamorphical painting: only a biased gaze will permit a proper understanding of what is being put into question. Delcy Morelos' work has often been interpreted as providing a visual representation of the bain de sang in which the country has been immersed for the last three decades. This might be true in part, but in a subtler, more personal way. Of Indian descent and born in an area of the country where violence has been present for decades, Morelos moved to Bogotá in the early nineties to pursue her career. Her works done in a muted paletteambiguous, oversized forms that existed in tight tension in relation to the canvassoon turned exclusively to a red pigment, applied in several layers over industrial paper with a sprinkle method, which resulted in heavily charged images. These volumes caught in the 'decisive moment' in which all pulsions overflow their rational container soon gave way to ample fields of color that filled almost the whole painted surface. This gave way, in turn, to a series entitled Color que soy (color that I am), in reference to the late poet Raúl Gómez Jattin, who died tragically after living a life in dereliction. Color que soy consisted in huge paintings done in the same method, but with a subtler palette of muted reds and browns, which in fact are the skin tones of close friends of the artist. Color and culture are closely linked. In Spanish, to speak of an 'artista del color' is clearly not the same as of an 'artista de color'; the former makes reference to a pictorial language while the latter denotes race, but the term 'de color' always refers to everything that is not white, as if the absence of color were the evidence of an absolute, impollute pristine stateâ€¦ the pure canvas is sullied with color. These generalizations fall well in a context where, in the absence of significant recent European immigrations to act as a contrast, people segregate from the heavily mixed racial margins, a country where to call someone 'indio' is considered an insult. There is nothing more pathetic than to hear a Colombian abroad stating with conviction his difference from what he considers 'colored people', while his phenotype denounces him in front of those races from which he inherited the attitude and habitude of segregating. Jesús Abad Colorado, a photojournalist based in Medellín, has followed human displacements caused by Colombia's internal wars, portraying the transformation of rural landscape due to political violence. Crude images in the press and TV are common sight here, so the visual sensibility of Colombians is numbed as a result of a continued exposure to violent facts. Not so long ago, TV programs agreed to present images of carnages only in black and white as a way of mediating violence, a measure that only lasted for a few weeks until it also became integrated as a code in our visual conscience, and its goal thus neutralized. This visual numbing contrasts with the subliminal effect of violent imagesthat results in collective threatas the public exposure of those murdered by the Mafia once acted as a warning for others: in its obligation to inform, photojournalism is symbolically kept hostage by those it is trying to denounce. Abad's images are shown in a slide projection, to stress the ephemeral nature of a given photograph in its circulation in the papers, but also as a remainder of the lack of visual impact of crude images in a context saturated with them. Define "context" brings together five artists and a photojournalist exploring a wide variety of media (on-site drawing, video-installation, photography, and painting) whose work reflects on the problems associated with the reception of a work of art in the absence of a "proper" context. It has been common practice to regard artistic production from the fringes of the art centers as "impossible to grasp" unless an "adequate context" is provided, be it political, sociological or religious. In the case of art from the margins, it is assumed that the work inserts itself in the space of a common, largely homogeneous, postcolonial history that is either taken for granted or presumed to be absent, thus leaving the work unable to be properly experienced or understood. But current globalization has made information available to all, and cultural referents are shared more horizontally by everyone regardless of the geographical or even political context. Under the cultural construct "History of Art", some things tend to be homogeneous, and local specificity tends to connect to global concerns. How, then, to define this "proper context"? The works that make up this exhibition revolve around the notion of context: questioning biased views of a territory that is not well known (José Alejandro Restrepo); reinstating suppressed histories, and showing that they can still be pertinent when removed from their conditions of production (Antonio Caro); making connections between similar concerns in totally different contexts (Juan Fernando Herrán); showing how a work is interpreted as a direct response to an extreme situation (Delcy Morelos); giving view to a local tragedy that is in fact the result of a global problem that refuses to be acknowledged (Miguel Angel Rojas, Jesús Abad Colorado). The video "Legalización", which humorously addresses the problem of drug enforcement policies, will be screened several times during the duration of the exhibition. Check this page for screening times and to learn about additional events related to the exhibition.